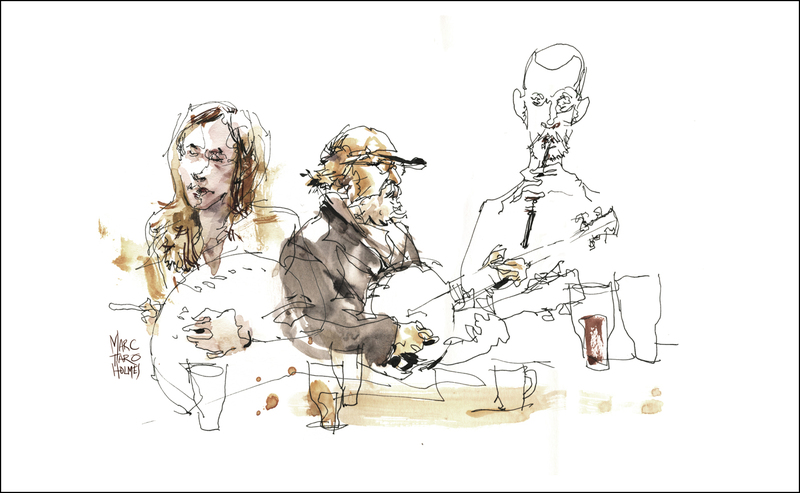 My friend Elissa suggested the Sunday afternoon Irish music jam session at McKibbins down on Bishop. 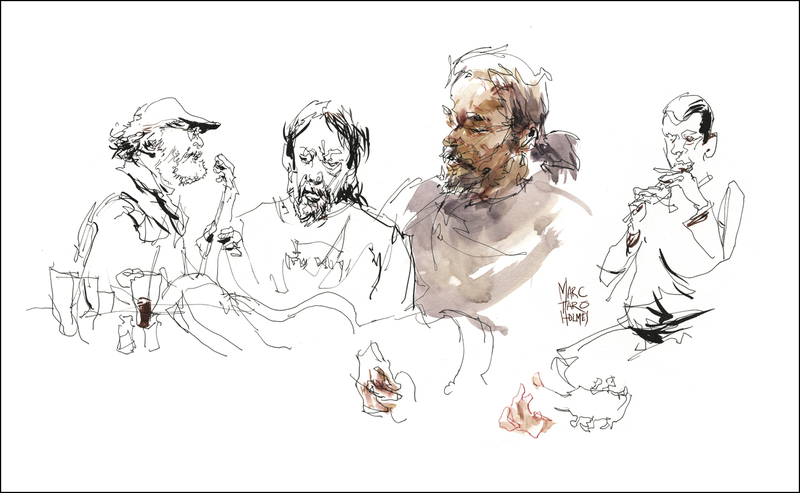 Always a great way to un-wind the pen line – listening to some live music and sketching the players. I’m posting these up for students in my Sketching People in Motion class. These are slightly different from the course work. In the videos I demonstrate using pencil first, before refining in ink. That really is a valuable step for beginners. But, if you’re getting comfortable with your people drawing, I suggest going straight in with the pen, as I’ve done here. Note how I’m keeping the color washes to the shadow shapes – leaving the lit areas white. Crucial to save that untouched paper-white. Keeps the sketch fresh. Also note how I’ve accented shapes of base color with darker touches of richer color (in the faces and hair), in the exact same way as the brush pen accents the pen line. It’s the same thinking – Large-to-Small / Light-to-Dark. As well – online students will note – pretty much no hatching at all in these. I just point that out to say – what you see in the video is a process that works – but you don’t have to use every element in every drawing. Take what you like, and use more or less of it. Thanks! And see you guys in the comments on craftsy.com. (Register at my everyday blog readers discount). I’m taking the drawing people in motion class at Craftsy that Marc mentioned! It is great! Highly recommend it! I’ve learned soooo much from you Marc! Taken the Craftsy course and am putting it in action. It’s the best step by step approach to expressive sketching I’ve ever seen. And thanks for your blog with all the process details. Love it! Velho massa de mais Bicho!!! I love your sketches. You motivated me to start drawing people again. Thanks for the tips!